Chosen Children International is a non-denominational Christian organization. We are not affiliated with any one church. We believe in God the Father, His son Jesus the Messiah, and the Holy Spirit as the three in one God. We believe that God sent His son Jesus into the world to save mankind from their sins. We believe He took all of our sins onto His body when He died on the Cross. We believe in living a holy and righteous life and that it is only by God’s grace that we can be holy. We believe the Bible is God’s Word and was given to us to guide us into all truth. We are non-denominational because we do not see denominations in the Bible. We believe all believers in Christ are part of His church. Our motto is that we seek to glorify God in all that we do. This motto is written on the sign on the road to our Children’s Village. These are our children at our second church plant around Lake Victoria. CCI was founded by Marilyn Cohn. Marilyn Cohn grew up in New York. As a young child she visited the Museum of Natural History and was enthralled by one room in the museum that housed all African artifacts. From that point on the calling to Africa took root in her heart and soul. Marilyn graduated from Hofstra University on Long Island, NY. She majored in Elementary Education knowing that one day she would go to Africa and teach. Believing that education is the key out of poverty, Marilyn has a driving passion to see schools formed all over Africa. Knowing that Christ has the answer to mankind’s problems CCI also is planting churches in places where there are no churches. 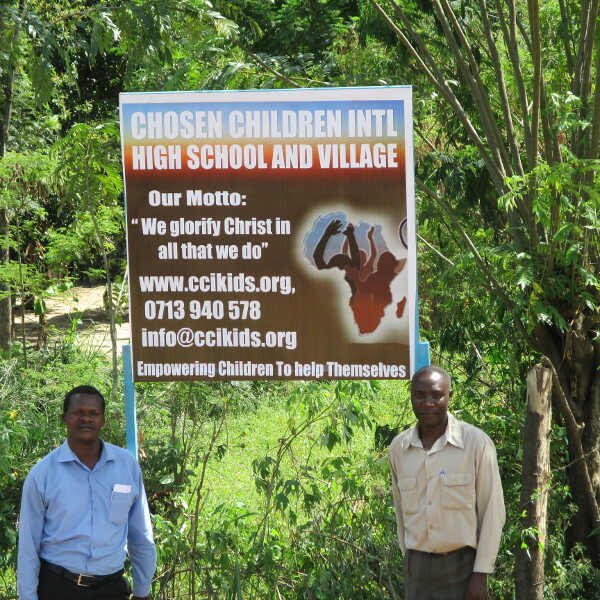 Currently CCI has planted two churches, one in Bungoma, Kenya and the second one around Lake Victoria in Kenya. Our Saturday Child Development Program: At both of our churches in Kenya we operate a Saturday Child Development Program. This is a program where orphans and vulnerable children come each Saturday to learn things such as good hygiene, how to prevent HIV, what changes to expect in puberty, how to respond in emergency situations, how to have a small business and help improve their family’s income, how important they are to God, how they are loved by God, and how not to be abused. These are only some of the topics they are learning. These children come to us with low self esteem but our program is helping them to learn to love themselves as they learn about the love of God. We also provide a warm nutritious meal for them for lunch. 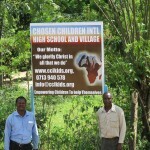 The work of Chosen Children International (CCI) is currently focused on the children of Kenya, East Africa. Over 35 million people live in Kenya. Of this 35 million over 2 million of the population are infected with the HIV virus. Of all the orphans living in Kenya 38% of them became orphans due to HIV/AIDS claiming their parents. The rest are orphaned due to tribal conflicts and illnesses other than AIDS. CCI believes the solution to this problem is the Children’s Village. In October of 2011 CCI bought 17 acres of land near the Kenyan/Ugandan border outside the town of Bungoma. We are using this land on which to build our first Children’s Village. When completed the Village will consist of schools from nursery school through technical college, a health clinic, a church, and 12 residential homes for children, and agricultural projects such as the growing of crops and the raising of animals and fish. CCI intends to build many children’s villages’ through-out Africa with this first one being a modcl for the ones to come. The key to these villages is that they will all be completely self-sufficient once they are completed. They are also completely eco-friendly. We are using solar power for electricity in our offices and houses. We will use bio-fuel in our cars and tractors and we will have our own water supply through wells and through streams. 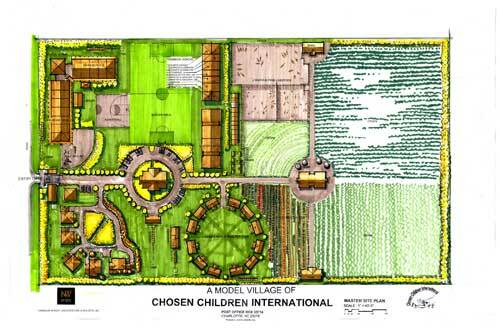 A layout of the Children’s Village. As of January 2014 at our Village in Bungoma we have built a church, a high school (new for this year) one house for 12 orphans, a greenhouse and a fish pond. There is still much more to be done in this Village and we welcome your help. If you have carpentry or masonry skills and would like to help us build one of the buildings in our village we would love to have you come. Come with a team from your church if you can or come by yourself or with a partner.. Please see our volunteer opportunities page for more information. 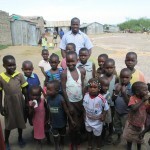 We also need monthly financial partners to help complete our Villages and support our children. If you can make a pledge please contact us and we will take your credit or debit card information for a monthly amount of your choice. You can also make a one-time donation on this website. Home Based Care Program: In addition to the children who live in our Children’s Village CCI also takes care of children who live with their grandparents or other guardians. This is our child sponsorship program. When someone decides to sponsor a child we help this child by paying for the child’s school fees, buying him or her a school uniform, books, and supplies for school. We also buy them clothes to wear when they are not at school. Children in Africa are not allowed to go to school without the proper uniform so this is often a barrier for a child’s education, especially for an orphan or a child from a very poor home. CCI only sponsors the poorest of the poor children. Our sponsored children attend our Saturday Child Development Program and receive counseling by our residential pastor.